The Navya Autonom Shuttle is the third in a series of autonomous vehicles that JTA is testing. The Navya Autonom Shuttle it rated for 15 passengers. JTA Skyway Senior Manager Harold Samms talks with WJCT News during a ride on the Navya Autonom Shuttle. An artist's rendering of JTA's U2C project. Plans to modernize and expand the Skyway into a system of elevated and street-level autonomous vehicles continue moving forward with JTA's testing of a third AV model. Former Amazon executive Bernard Schmidt is being brought aboard to serve as JTA’s vice president of automation. Schmidt will be overseeing all elements of the project called the Ultimate Urban Circulator (U2C). As Schmidt comes on board, JTA’s third test vehicle is making its way down the test track parallel to Gator Bowl Boulevard. WJCT News took a ride on the Navya Autonom Shuttle on Tuesday. The latest test vehicle is larger than the two models previously tested. The Navya can accommodate up to 15 passengers – 11 seated and four standing. JTA Skyway Senior Manager Harold Samms said Navya expects its vehicle to achieve up to 14 hours of runtime in normal conditions before a recharge is needed, although so far in testing, JTA is seeing real world run times about four to five hours below that. Navya’s website says the vehicle has a “theoretical” battery capacity of 33 kWh and recharges in four hours when charged at a rate of 7.2 kWh per hour. The test vehicle is limited to 16 mph, according to Navya’s spec sheet, although Samms expects that whatever vehicle is ultimately deployed will travel at speeds up to 30 mph or so. Right now the test vehicle runs occasionally along a test track under the Hart Expressway ramps by Metropolitan Park. As testing continues, Samms expects the first leg of the autonomous system to be open before the end of 2020. The first public line is planned to run between the existing Jefferson Street Skyway Station and the new JTA Regional Transportation Center, which is being built across the street from the Prime Osborn Convention Center. 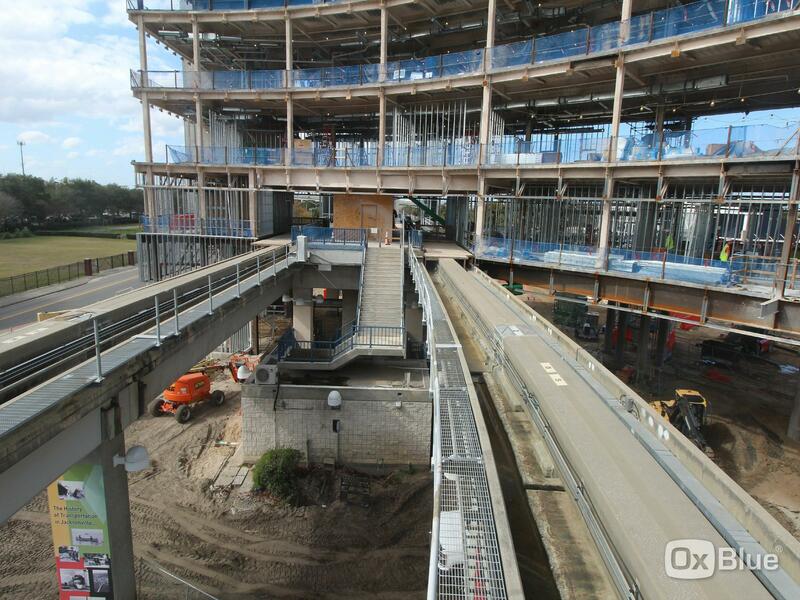 This view of the under-construction JTA Regional Transportation Center shows where the Skyway track will enter the station. In the first phase, one side of the track will be modified to accommodate an autonomous vehicle that will also be capable of at carrying passengers at street level. JTA will have a contractor modify one side of the elevated track to accommodate the U2C. The other track will still be used for Skyway cars in the inititial phase. The autonomous vehicle that is ultimately chosen for that first leg isn’t necessarily what will be rolled out on a larger scale. “We want to be able to be agnostic and have several different vehicles that can operate in and around our infrastructure and our environment,” said Samms. JTA and the city recently secured $25 million in federal funding that will help turn driverless electric vehicle mass transit into a reality. And that’s where Schmidt will fit in. “Autonomous vehicle technology will transform transportation in cities around the globe. With the hiring of Bernard, the JTA has successfully reached the next milestone of implementing an autonomous vehicle transportation system in Northeast Florida. His unique industry knowledge and results-oriented leadership will help us develop and advance these complex, high-tech transportation solutions,” said JTA CEO Nathaniel P. Ford Sr. in an email to WJCT News. 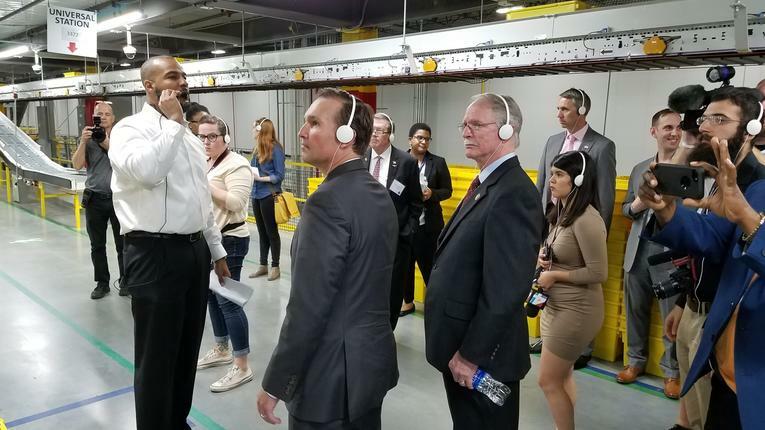 Bernard Schmidt (left), then general manager for Amazon's Jacksonville fullfillment center, is pictured in April giving a tour that included Jacksonville Mayor Lenny Curry (center) and U.S. Rep. John Rutherford (right). Schmidt previously managed more than 3,000 Amazon employees and launched a nearly 1-million-square-foot robotic sortable fulfillment center in Jacksonville. JTA has also teamed up with Florida Polytechnic University's Advanced Mobility Institute on driverless vehicle research. Schmidt will also play a significant role in the multi-agency partnership to turn Bay Street into an innovation corridor that will eventually feature the autonomous vehicles, new security features, software and perhaps even solar sidewalks. JTA’s latest autonomous test vehicle will be on display Thursday evening, January 24, outside of WJCT Studios from approximately 5:30 p.m. to 8:30 p.m. Although the event is free, RSVPs are requested. Join The Jaxson on Thursday, Jan. 24, for a free discussion focusing on the impact of Jacksonville's changing demographics on current and future transportation initiatives called Getting There in Jacksonville: A Changing City Confronts Its Transportation Future. This event is FREE, bur RSVPs are requested. REGISTER HERE. Plans for a transportation, energy and safety innovation coordinator running through Bay Street in downtown Jacksonville have been visualized in a new video presentation.